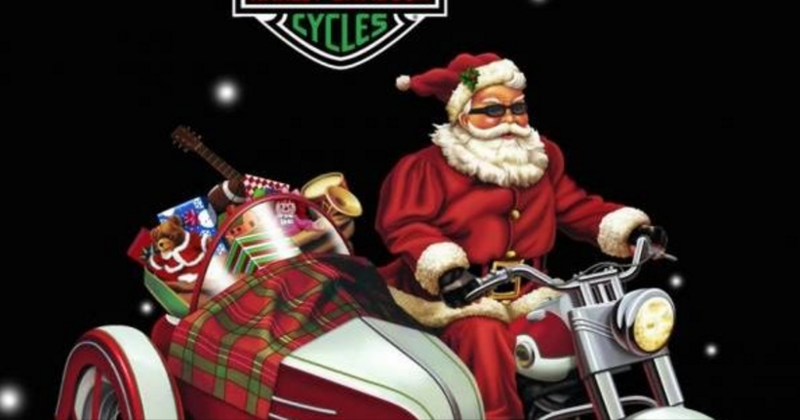 Santa and Mrs. Claus will ride into Mike’s Famous Harley-Davidson® in New London on Saturday, December 12 from 12 – 3 p.m. for the area’s annual Toys for Tots campaign. The free event will include photos with Santa and the whole family … even pets are welcome. Santa will greet visitors in a Harley-Davidson® sidecar set in front of a traditional stone fireplace within the former Coca-Cola® factory. Each child will receive a free gift from Santa, and parents will receive a $10.00 gift certificate to Mike’s Famous® for each toy contributed. Festive refreshments will be provided for all who attend. Mike’s Famous Harley-Davidson is the New London County collection and staging headquarters for Toys for Tots, locally sponsored by the Thames River Detachment Marine Corps League. For months, the community has been donating toys and the Marines have been collecting, sorting and staging the gifts inside of Mike’s Famous. The initiative will provide toys to children represented by dozens of charities and non-profit organizations this holiday season. Additionally, non-perishable food items are being accepted for donation to the Gemma E. Moran United Way Food Center. “We are thrilled to be working with Mike’s Famous Harley-Davidson for the third consecutive year on our annual toy drive,” said Jim Reid, Junior Vice Commandant of the Thames River Detachment Marine Corps League. “As always, Mike has gone above and beyond the call of duty and has spent considerable resources to accommodate our needs. We are pleased that Mike’s Famous has been recognized by the Chamber of Commerce for its continuous support of the area’s military community,” Reid added. Mike’s Famous Harley-Davidson is located at 951 Bank Street in New London, CT. The dealership opened in March of 2014 in 55,000 square feet within the former Coca-Cola® bottling plant. It also represents the Can-Am® brands of ATVs, Side-by-Sides, Spyders® and Sea-Doo® Watercraft, and carries the full line of Polaris® recreational products.